LazerBrite® Modular LED Light System. Reinventing The Flashlight. Traditional glow sticks glow and traditional flashlights produce a beam, but the American made LazerBrite® Modular LED Light System does both and a whole lot more. Users are able to customize each light to meet specific needs. Function as a wide-angled flashlight. Separate into two lights for sharing. Multiple units can be linked together to create a longer light baton in any color combination. LED bulbs are visible from over one mile away and never need replacing. Lazerbrite is fully waterproof and batteries come included. Long burn times provide reliable lighting when you need it. LazerBrite is built tough in Moab, Utah with the highest quality components we can find. Military Tactical Modular Flashlight Used by the U.S. Army as a cost and space saving system, LazerBrite® is amazing as a military flashlight and offers improved safety as well as reduced environmental impact. The LazerBrite® product line is being purchased by the military via DOD contracts, direct purchase to military units, and through GSA Advantage. 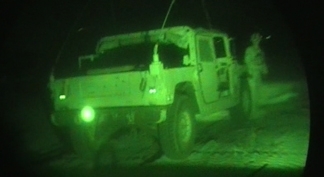 Military and Law Enforcement: The LazerBrite is the best LED flashlight for signaling, marking, personal lighting, available in infrared or visible light. In addition, it is available as an infrared flashlight. Emergency Preparation: 10 year battery shelf life, small, lightweight, waterproof and reliable, with up to 150 hours of battery life, the LazerBrite LED flashlights are perfect in natural disasters (or zombie attacks). Industrial Safety: Use LazerBrite tactical flashlight on construction sites, oil-rigs and road and transportation projects to mark hazards, equipment, chemical spills or for other visual signaling - Also, personalize this cool flashlight by adding your company's logo for a great, functional safety award. 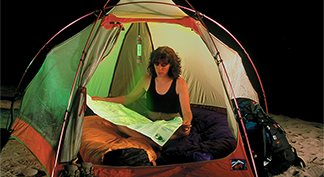 Outdoor Recreation: Use as a tent lantern, flashlight, glowing marker or signaling unit while biking. Hunting: Use LazerBrite Visible colors for all your lighting needs, blue for tracking, infrared with night vision equipment. Infrared Hunting not legal in all states. Private aviation: Backup cockpit lighting and in your emergency kit. 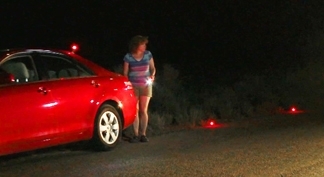 Child Safety: See and be seen in traffic and use in place of a glowstick on Halloween and 4th of July. Camping Gear - This tactical flashlight is an absolute must have for camping. It is by far one of the best flashlights for camping available. The Best Tactical Flashlight With thousands of LazerBrite® units currently being used by the U.S. military, the LazerBrite® LED tactical flashlights have been praised as one of the finest tactical flashlights available. Multifaceted, lightweight and submersible to 50 meters, this distinct LED light system has been custom-built for the serious user, providing light with unique advantages. Glow Sticks and Chem Lights - Each LazerBrite® unit can emulate chemical glow sticks, function as a wide-angle flashlight, separate into two lights for sharing, and produce a focused spot. These features are part of what makes it the best tactical flashlight. Waterproof Flashlights - Submersible to 50 meters and available in 6 visible colors plus infrared, LazerBrite® is the best tactical flashlight and the ultimate safety light. Batteries are included and with up to 150 hours of illumination, you can trust LazerBrite® to be ready when you need it most. LazerBrite reinvents the waterproof flashlight. Traditional glow sticks glow and traditional flashlights produce a beam, but LazerBrite’s modular design does both and a whole lot more. Users are able to customize each light to meet specific needs. LazerBrite® LED tactical flashlights can be used in multiple units so that they can even be linked together to create a longer light baton in any color combination.